Forthtal Schmalspurbahn is a freelance depiction of a line near the Austrian,German and Swiss borders and the traffic you might see on it. At one end you find Tschagguns station serving a busy tourist orientated town with its island platform station. 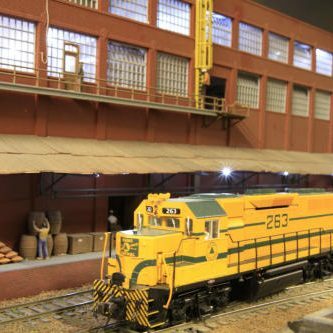 It also serves local industries with several trains daily for the coal and lumber yards located to the north of the town and station. The line leaves Tschagguns and crosses a large viaduct with the river far below. On the far side, the line splits with one line heading to the Drunkens Brewery and the other reaching Lower Forthtal station . The brewery is holding a Beerfest in the grounds of the building and lots of visitors have come along for an afternoon of music, dancing and drinking. everyone has taken advantage of the train service so they can enjoy themselves without drinking and driving. The line then disappears into further tunnels to continue the journey down the valley. Look out for the working road vehicles running along the layout, crossing the valley by a traffic light controlled single lane road bridge and then reaching a railway level crossing which automatically stops the vehicles when trains approach. The cars and trucks use the Faller road system which consists of battery powered vehicles that follow an iron wire buried in the road surface. The batteries last about 4 hours and are rechargeable. 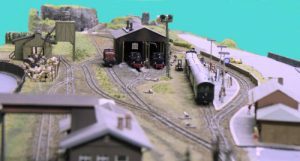 The layout is DCC controlled. Forthal Schmalspurbahn translates from German into English as The Forth Valley Narrow Gauge railway. The Floor Area required for the layout is 8m x 3m. The layout is operated from the back and will need space for the 2 operators to work. A 3rd operator can work at the front, controlling the cars and talking with visitors.